“They are my go to place for plants”, “Throughout the year they hold different events. Everyone that I have been to has been wonderful!” Amazing feedback provided by customers who have the ultimate Wassson Nursery experience. A successful plant, outdoor living and landscaping authority in Fishers, Muncie and Union City. For over 40 years now they have maintained quality service, beautiful landscaping and extraordinary outdoor living. Wasson Nursery stands on the thrust of building better backyards for families across Indiana. Running an organization like Wasson Nursery with businesses with several locations is not easy. It has its opportunities and challenges. Those additional locations are symbolic of business growth and a lot of hard work. Strong Leadership: Hire candidates that are good for your company. These key people and their skills will serve well as you cannot be at all locations all the time. Have a detailed job description so the business can run effectively without you. Establish Standard Operating Procedures. This will enable to put your team on the right track. By this, it means things should be done in the same way, regardless of the location. This will also be good for your customers. It ensures that they can expect the same level of customer service and results regardless of the location. Make communication a priority. Once you have establish a good communication system, make sure to use it. Research shows, businesses with multiple locations spend an average of 17 hours a week repeating and clarifying communication. Eliminate the redundancy. Set up a group email chat or internal website to have employees check consistently. A VoIP system can also help a lot. It eliminates the use and costs of telephone bills. Simplify operations with Technology. Make your life and employees’ life a lot simpler by having the right tools to manage multiple locations. 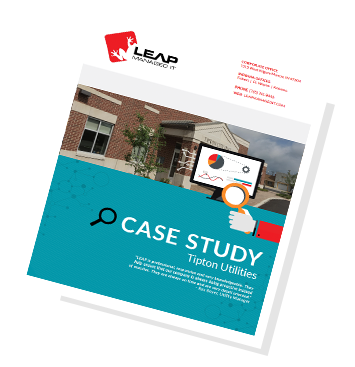 With Leap Managed IT’s IT Master Plan, they can custom tailor an IT blueprint that can help your business run efficiently.